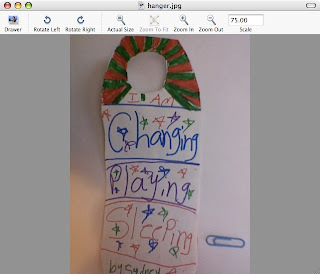 Making these door knob hangers is easy and fun! They can be any shape or colour, but remember to cut a hole big enough for the door knob! Instead of saying "Keep Out!" you can make one like this! Write down the different things you do in your room and use the paper clip to point what you're doing at different times of the day. Extras - add glitter or stickers. Put your name on it and draw your favourite things. You can make one for any room in the house, so be creative! If you make it double-sided it might be a good idea to glue two pieces of paper together so the colour won't show through.